It can't be a good sign when my weekly quotient of review material arrives with a sympathetic apology from the powers that be. Such was the case with Marvel Apes #2, and with good reason. It's tough to remain impartial about a mini-series when the very premise seems to be no more than a thin, bad joke, but such is my task this afternoon. Behold the Marvel Apes: discovered through a chance series of events involving a scientist, DNA, a villain masquerading as a lab monkey and an interdimensional portal, these simians populate a universe in which man never rose to rule the Earth. Naturally that means the responsibility of dressing up in spandex and fighting crime has fallen to the chimps, and they've embraced that call of duty. In the two stories crammed into this extra-sized issue, Karl Kesel and Tom Peyer each take a turn at penning the apes' adventures. The authors are virtually indistinguishable, delivering two heaping armloads of bad puns and a surplus of shamefully unfunny parodies of mainstream superheroes. Doctor Ooktavius? The Mighty Thorangutan? Are you serious?! This is a collection of the very worst elements of Marvel's history, the homage to a path blazed by Spider-Ham that I'd been dreading for years. While there's an undercurrent of serious plot running beneath the ridiculous gimmicky faux-humor, it's bargain basement at best and utterly buried beneath a mountain of cheese. That's not to say that the book's tone is its primary handicap. There's certainly a place for comedy in mainstream comics, even lowest denominator-targeted goofball humor like this. Deadpool has been the star of that style of book, off and on, for years and he's no worse for wear. No, where the Marvel Apes train sails off the tracks is about six inches away from the terminal: the problem is with the premise itself. Was there really a need for this? 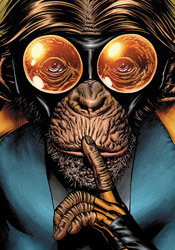 Was anyone banging on Marvel's door, demanding a horror-tinted world of simian superheroes? Even if they were, is this actually entertaining them? Every time I think the story can't get any dumber, it manages to top itself on the very next page. I think this level of stupidity would insult even Rain Man. Ramon Bachs and Karl Kesel provide the artwork for this month's stories, and they too produce very similar results. Neither can decide if this issue should be filled with apes who walk like men or men who act like apes. They lumber around the page with strange proportions and stretched anatomy, rarely resembling monkeys so much as they do strange, furry, flat-faced humanoid aliens. Each successfully delivers the light tone that the bulk of the story demands, just not in a way that I found even remotely appealing. Maybe I was disturbed by the image of the more scantily clad ladies of the Marvel line as apes, or maybe these artists just had a tough time coming to grips with what they were being asked to illustrate (unlikely, since Kesel actually wrote the primary story). Either way, this ain't pretty to look at. Marvel Apes #2 is punishment. If you've been reading Marvel Comics for any length of time, chances are good that at some point you've come across a moment that made your eyes involuntarily roll. I'm a die-hard fan of the line, but I can't deny its lasting tendency to cross the line occasionally and grow a bit too silly for its own good. This issue is like a roundup of every such moment, capitalized by a cast full of overdressed gorillas. It's terrible. Just terrible. SKIP.